This concentration emphasizes the application of mathematics to fields such as biology, engineering, computer science, physics, aeronautics, astronomy and geosciences. Students preparing for a career teaching mathematics in middle school or high school can fulfill the prerequisites for the California Commission on Teacher Credentialing. 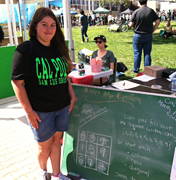 Students who want to pursue an advanced degree in mathematics will find a broad and rigorous curriculum at Cal Poly.